Amped FIVE is the most advanced software for enhancement of security videos and Milestone is the leading provider of IP video management software. FIVE is fully integrated with the Milestone XProtect server; with FIVE you can process, in real time, the live stream provided by the XProtect server or apply any image enhancement filter to a specific range of time to files in the archive. 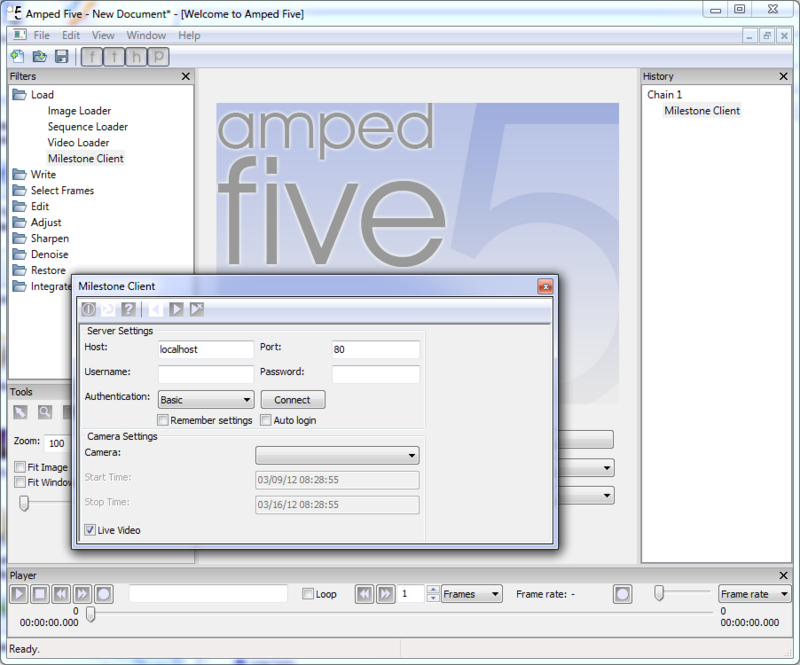 Milestone integration is included in both our Amped FIVE Express and Amped FIVE Professional editions. What are the benefits of Milestone integration? Importing and exporting is always a time consuming phase of analysis. Conversion of many proprietary formats can lead to errors that can invalidate a case or may not even be possible. Downscaling and conversion features of some proprietary players often reduce resolution far too much and may lead to the loss of precious information or introduction of new problems in the image or video. Milestone and Amped have partnered to address these problems and offer Milestone users a robust and elegant solution. With the integration of FIVE with Milestone you can save a lot of time and better manage the workflow without the risks of losing quality or data. Thanks to this integration partnership Milestone is the only IP video management software that offers advanced image enhancement features and FIVE is the only forensic video enhancement and analysis software integrated with a surveillance server. Speed is also a huge benefit. The innovation with Amped FIVE is that every tool and setting is a filter. Whether you are loading a file, selecting frames, or modifying the contrast; in FIVE you are simply applying a filter rather than re-rendering an image or modifying the original stream. With this concept, you can combine an unlimited number filters in any order to find the best solution and result. Adding, deleting, or reconfiguring filters is done without modifying the original file. In this way it’s very easy to test different combinations until you reach the desired result or modify filter settings on a live stream as environmental conditions change or for a new area of interest. Basically you can apply any filter in Amped FIVE on a Milestone stream or archived video. For live streams, processing and filters can be applied in real time. No conversion is necessary and both resolution and data integrity are maintained.